It would be nice to give it a try but wouldn't the phone or camera obstruct LSG's face even if we do get a clearer view of the reflection in OYS' eyes ? If someone wants to give it a try though, please do. It sounds fun. Hmm, what an interesting mystery to solve So let me put together a summary (plus some facts). By the silhouette, it looks like a male. The ice cream has two spoons so it's definitely for two. OYS's staff is also in SK around the time and so is her usual travel buddies. Angle of the picture indicates the one taking the picture is someone taller than her. 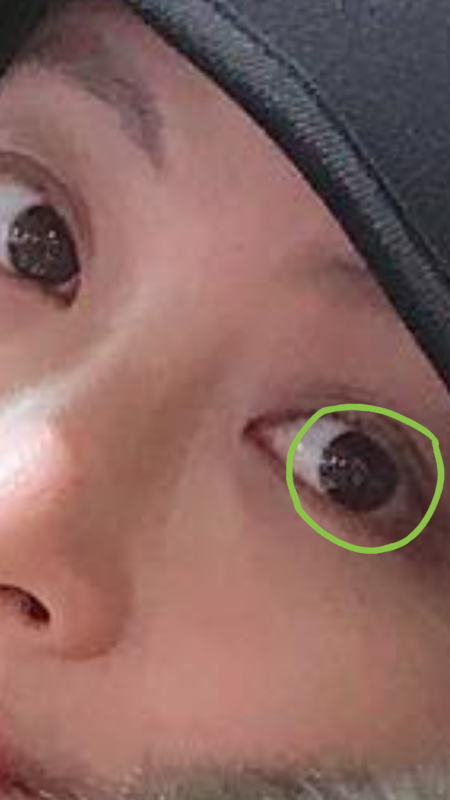 To be honest, im not focus about the﻿ reflection ﻿in OYS' eyes﻿﻿, but when you see clearly and zoom third gif of @klila , you can see the saliva on Ohgong's outer lip. I couldn't believe my eyes. Is it true? or it is true.. Sorry, maybe my eyes aren't very good. Haha the legendary page 50s will always be so easy to remember. I swear the page moves like 10 pages a day with the analysis of zoomed-in screenshot, slowed-down gifs and people sharing their experiences lol. All jokes aside, the fact is that fans of OYS definitely knows how her kiss scenes went on all her previous dramas (unnie mianhe, you know I love you ). Now compare that to Hwayugi starting from one of LSG's favourite scenes - activation kiss - and you'll understand the significance of the difference. Body language is science, no matter how good an actor/actress is. Even the smallest things can mean something, so it's up to those who are observing to interpret those. lots of gifts videos and pics about the saliva. To bad I can’t post pics but i know my fellow shippers will posted for mee soon. And I think this was shared before as well (maybe?) but there's no harm in sharing again lol. Omg you girls are amazing lol. That male figure is wearing a white mask right? It could either be a mask, or its the phone that OYS's companion is holding while taking the picture like @iffahmmmentioned previously. Edit: On second thought, looking at the picture again it does seem like a face mask especially the wide white outline that runs from ear to ear of the person. Hmmm.....what I notice from this gif is someone eyes that was enjoying too much. Wasn’t he supposed to hate her character to death in this scene? and of course the Infamous YSL Belt! !